The Italian co-operative network tells me that the recent earthquake has had a real impact on the residents and businesses in the area between the provinces of Modène, Ferrara, Bologne et Mantova. 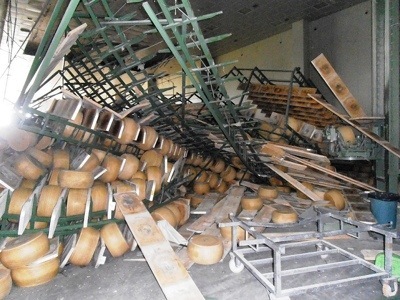 The quake caused considerable damage to several cooperatives, notably those that produce parmesan, in which thousands of cheese wheels have been damaged following the multiple tremors. To be vulnerable is all too human, but the way that our vulnerabilities are played back to us to sell products is business gone wrong. So congratulations to the YMCA and parliamentarians for the report out today on body image. The best materials I have seen since Agnes Nairn and I published our book in 2009, Consumer Kids, is the Rainbow Resources on sexuality and gender from the Woodcraft Folk – practical and progressive, recommended for all with kids around. 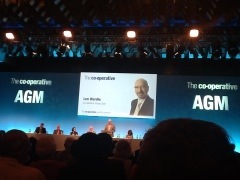 At the Co-operative Group AGM here this morning, Len Wardell (the elected Chair) draws applause when he responds to the comments in the Financial Times that questioned the fact that ordinary people are elected onto the board of the Co-operative Bank and Group. He asked the plasterer, the nurse and the Methodist Minister to stand up in the hall, to warm applause. If British banks had had the same governance, he argued, the UK might not have had the credit crunch. The word ‘to own’ is bound up in origins with the word ‘to owe’. Many thanks to Pat (Conaty) for pointing me to this. Formed in 1972, the West Highland Free Paper serves the UK’s most isolated communities across an area of 250,000 square miles. In 2008, with the support of the Baxi Partnership and a little but more from Co-operative and Community Finance, the paper was bought out by the staff, with the aim of keeping its high quality journalism in good shape. At present West Highland Press make a small profit of around 2% of turnover. Their role is not to provide a great profit – though they wouldn’t be averse – but to create a working environment built on security, good treatment, respect and control over working conditions. Without this co-operative form of ownership, the paper would have been sold off, amalgamated or closed. Their story and that of a range of other inspiring media co-operatives, including household names such as New Internationalist, is told in a wonderful new report we have published called Good News, written by Dave Boyle. Roy Greenslade, covering the report for the Guardian calls the report “a plan to transform the ownership of local and regional newspapers” in the face of threats to their survival. 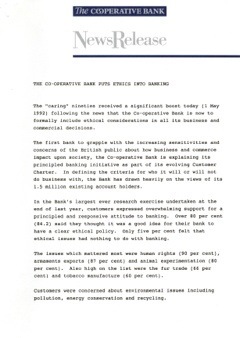 Twenty years ago, today, the Co-operative Bank launched its ethical policy. It proved to be a pioneer of the ethical consumer movement, a commercial success over time and caught the imagination of the world. Today, the ethical policy has developed into a fully fledged ethical operating plan, affecting every part of the Co-operative Group, not just bank but food and pharmacy too. If you care about social change, the good advice is to display as much joy as you do anger. We need to celebrate every step we win towards a fairer and more sustainable economy.